Continuing my series, interviewing some of the most successful bloggers of the moment, this week I am talking to Emily Leary from hugely successful blog A Mummy Too. Originally a parenting blog, Emily found her niche in the food blog arena and quickly made herself known. 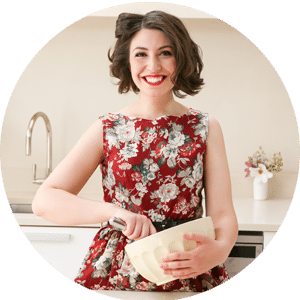 Her blog this year won Best Food Blog award and Emily has been featured in magazines and run workshops and presentations at many prestigious events. On top of all this, her blog is in the top ten bloggers on Teads, Tots100, Foodies100 and Cision. Can you tell me a little about your background before blogging? How did you get into it? I started out in PR and marketing while still at uni and soon found my specialism in the digital/social sphere. By the time I started my blog, A Mummy Too in 2011, I’d been in digital for about 10 years. The blog was just intended as a hobby while on maternity leave, but I kept it going where I could once I went back to work and really fell in love with it – the creativity and the community especially. After a couple of years, I knew that blogging was where my heart was, so I decided to leave my career behind to write about food and lifestyle full–time. Having worked in the PR industry for a number of years you must know better than many of us how it is to work from the other side of things. Are there any insights you can share on what PR's are looking for? I think something that comes up time and time again is understanding why they want to work with you. Whether in-house or agency, PRs and marketers are ultimately working to meet their company/client’s business objectives and more specifically, that year or quarter’s marketing objectives. They’re not (or at least shouldn’t be!) simply doing blogger outreach for the sheer fun of it, rather it will be part of a plan for the year, so the better you can understand how you fit into those plans, the better equipped you are to deliver your part in the campaign to the highest standard. If a brief feels loose and you’re feeling a little unsure as to what activity to propose/deliver, it’s completely fine to say, for example, “Can you give me a little outline of what the campaign is aiming to achieve and any key messages you’re looking to convey?" You are a well known full time blogger, has your previous experience helped with this at all? What would your advice be for someone who is looking to turn blogging from a hobby into their career? Start treating your blog as a business long before you begin to rely on it as your sole source of income. Be organised, keep records, plan, standardise your working processes, rates and terms and organise them along with your credentials into a media kit to share with brands, learn from your analytics, strive to continually improve on your own best. You must pitch a lot to different companies, what seems to work best for you and what not so much? I rarely, if ever, cold pitch – it’s much easier to propose an approach when you know what campaigns that brand/agency is working on at that time. I prefer to focus on warm/responsive pitches i.e. when a brand gets in touch to tell me about a campaign, if it’s something I feel is a good fit, then I’ll come back with some ideas about how we could work together. Emily is a full time blogger at A Mummy Too and can be found on Facebook and twitter.